Our goats eat well. They have grass, bushes, trees and hay available to them all day long. In addition, at around 5 pm each day, we feed them some prepared goat food made largely from grain. They love it! They eat it like it is candy and they squabble and push each other for it. Usually they are waiting for me when I come with their pans with food but today I got everything ready quietly before they noticed. 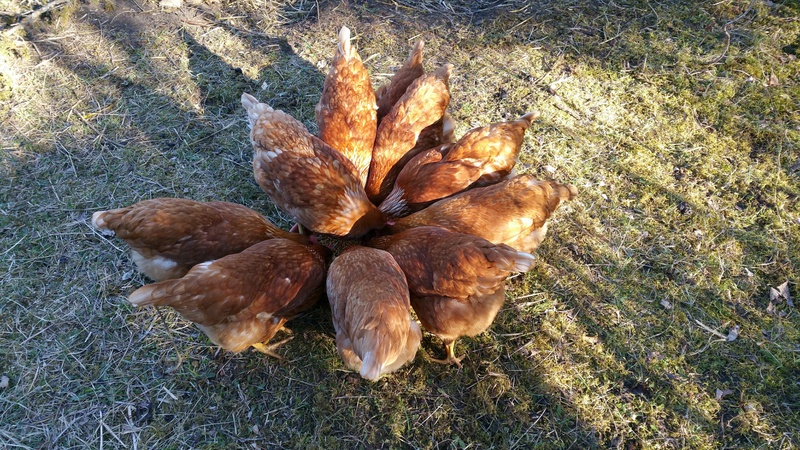 The chickens noticed and were delighted with the unexpected bounty and crowded around to help themselves. The chickens could not believe their good fortune of getting to the goat food first and they crowded around it eagerly. I have one food pan out for each nanny plus a pan with special food for the kids in a “creep,” which only the little ones can reach. But the nannies aren’t content to stick with one pan but rush from one to the other. You might notice the brown nanny, who quickly asserted herself as the dominant one in our little herd, brushing the others aside when she decided to change pans. The others also push each other around, trying not to be the one at the bottom of the heap. Their constant competition to establish themselves in the “pecking order” is apparently very normal among goats but it does bother me some. I always keep a little grain back and offer some by hand to the one or two who get pushed away from their pans. Occasionally I will grab the dominant one by the horns to slow her down when she begins butting the others away too vigorously. She behaves well with me but goes back to her domineering ways as soon as I let go. Oh well….I’ll just have to keep trying to encourage more ‘lady-like’ behaviour.